We are of the firm conviction that real change only becomes possible when it happens in an “inside-out”, or, when thinking in terms of dynamics in supply-chains, in a “bottom-up” manner. Our SHERPA Management System is specifically and purposefully designed to encourage, support and enable this type of change process. The more decision makers on a farm (or any business in a supply-chain for that matter) feel they truly “own” the sustainability agenda for their business, the greater the potential for fundamental shifts in business practice towards those that are genuinely sustainable. As we engage with farmers, suppliers and retailers on this approach, so our conviction is affirmed and reinforced – there is a real and growing appetite to look at alternative supply-chain improvement and risk management processes that move “beyond certification”. But, it is at this positive junction that the inevitable questions start to pop up. “How can we trust the output?” … “are the self-assessment ratings reliable?” … “yes but, we still need to verify the results” … and before long we are drawn back into the debate over how one builds assurance into a bottom-up program without killing the very essence of “bottom-up”. Before setting a meaningful proposal on the table to address this, it is important to step back and look at what the real issue is. At a very fundamental level the need for some form of assurance is the absence of trust: parties at different points within a shared supply chain simply do not trust each other enough – “I cannot trust what you are telling me, so I need a third-party to check what you are saying”. When one couples this lack of trust with the power imbalances inherent in supply chains, the emergence of command-and-control (top-down) certification schemes as the approach of choice becomes understandable. But, as well intentioned as these schemes inevitably are, they are the death knell to the bottom-up/inside-out processes of change so needed, and they further erode the trust that is already in such short supply. A vicious cycle emerges of decreasing trust/increasing imposition of standards/less ownership of the sustainability agenda…and so on into an environment of less and less trust, more and more box-ticking and less and less impetus for the much-needed changes. Rather than being catalysts for change towards a sustainable future that they have all set out to be, these programs, ironically, end up stalling innovation and entrenching business-as-usual. Supply-chains so desperately need the trust they seem so bereft of; in the context of the complexity and dynamic nature of the environments supply chains find themselves in today, the building of trust and transparency is indispensable to sustaining competitiveness and strategic advantage. How does one begin to address this? Trust is the intention to accept vulnerability based upon positive expectations of the intentions or behaviours of another. Vulnerability is therefore a key character of trust and implies an acceptance of the risk of being disappointed. 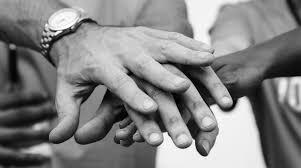 The paradox of trust is that only trust breeds trust. That means that to receive trust one has to assume trust. Also, the decision to trust is at the same time a decision against control – trusting someone means that you do not need to take the trouble of checking on them and accepting the chance of them disappointing you. This leads to the question as to who should take the first step in trust building, particularly when trust levels are low. Transparency has an important role to play in this regard, it is an important precondition and mediator for trust, and vice versa. But, for transparency to play this positive role it cannot be prescribed by one party to another, it has to be voluntary. Prescribing transparency – “thou shalt share your information with me” – takes us deeper into command-and-control, eroding trust further. Trust building can commence when steps are taken to voluntarily share information (to be transparent) with the other party. As information is shared so trust builds, and as trust builds so the information is more willingly and openly shared. The paper points to the building of trust and transparency as a sensitive and respectful “dance”; sensitive in that the process must never be allowed to push for more disclosure than the trust allows for, and respectful in the sense of acknowledging the other party’s willing, but voluntary, participation in the process. It is this “dance” that we have attempted to capture within our Virtuous Engagement Loops (VEL) approach. VEL’s are formed when one party voluntarily shares information about themselves with another party, and the recipient uses that information to engage constructively and positively with the supplying party, for the benefit of both parties. VEL’s are virtuous in the sense that they have the potential to create an upward spiral of increased transparency, increased positive engagement, increased trust, and so on (as opposed to the stalemate of low trust/low impact that currently characterises many supply chains). Why it is worth engaging in this “dance”? The answer provides a compelling justification: In the context of supply chains, we engage in trust building in order to enhance the quality of information sharing with each other, in order that we are all better equipped to make better operational and strategic decision, in order that, as a supply chain, we are able to be in a strategically advantageous position relative to our competitors. Climate change and other sustainability drivers serve to increase the variability and unpredictability in these systems, magnifying the need for trust and transparency. It goes without saying that VEL’s will be as effective as the quality of information that is shared and around which the VEL’s form. So before looking at the VEL process in detail, it is important to make a point about the quality of information that SHERPA is able to provide. The SHERPA process includes self-assessment, which by its nature is subjective, as well as Performance Indicators, which are a suite of objective metrics that measure performance. These both serve to highlight areas of weakness or risk but, importantly, the Performance Indicators serve as an internal “verifier” of the self-assessment ratings: We see many instances where a high self-assessment rating in a particular subject-area is challenged by a Performance Indicator that indicates a weakening in the area. This built-in cross-checking capability within SHERPA coupled with the detail of the information collected and shared via SHERPA, ensures that VEL’s develop around rich, high-quality, information. Parties in the supply chain (for example farmers and a retailer) agree to the ethos of the bottom-up approach and the need for a new approach to building trust and transparency based on voluntary information sharing and positive engagement between the parties. This can be formalised in a “Letter of Commitment” signed by both the farmer and the retailer. It is important that the farmer’s participation in the program is voluntary and they have the option to opt out at any stage (and revert to the conventional assurance models applicable in the supply-chain). The farmer and/or leadership team adopts the bottom up tool (SHERPA) and uses the self-assessment and the measurement of Key Performance Indicators to identify areas of strength and weakness, followed by the prioritization of areas requiring improvement and the development and implementation of improvement plans. This is an internal process and the output can be shared internally as and when the farmer and/or leadership team feel SHERPA can add value to the broader management and improvement processes (for example, the SHERPA improvement management module allows all improvement tasks to be centrally delegated, tracked and updated). Internal Virtuous Engagement Loops develop as more personnel within the business engage in dialogue about the output and its interpretation, as well as the prioritization of areas for improvement and the defining and execution of improvement actions. In this step the bottom-up nature of the program finds traction where it matters most – at farm-level. As farmers and their staff engage in the SHERPA processes and the output reflects the farm’s reality, so their ownership of the sustainability agenda for their farm begins to increase, and their confidence to share their output – to tell their story – increases. As confidence in the bottom-up process/tools develops so the farmer can consider sharing the output beyond the business. A first step in this expanded sharing could be to elect to have the output reviewed by Blue North (this is an option within the SHERPA App and can be selected at any of the Steps by the farmer). The Blue North review is simply an objective “quality control” exercise to identify any areas of misinterpretation, missing or erroneous data etc., and provides a first safe step in the process of sharing output with other parties in the supply chain. Ultimately Step 3 should lead to the voluntary sharing of some or all of the output with the Retailer. This sharing is always voluntary and to the extent set by the farm (for example, as a first step, the farmer can elect to share output related to the environmental performance of the business, with the social and economic output only being shared once confidence in the VEL with the retailer is established). The retailer, in response to and empowered by the rich detail of the information being shared, and guided by the agreed ethos of the program as set out in the Letter of Commitment (Step 1), can now enter into a meaningful and productive dialogue with the farm about areas of strength and weakness and corresponding improvement plans etc. The emphasis of this dialogue is on understanding the risks/weaknesses identified and to lend weight to proactive risk management and problem solving. 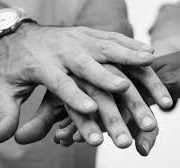 Constructive engagement embraces a language/approach of partnership and joint problem solving that reflects the shared destiny of the parties. It is a distinct and decisive move away from the judgemental and trust-destroying dialog that characterises compliance programs. 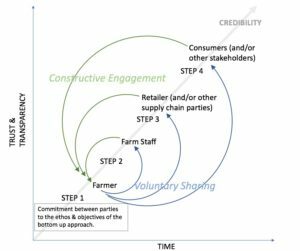 The Virtuous Engagement Loop that develops between the farmer and the retailer is characterised by increasing transparency, increasing positive engagement, increasing alignment of effort and increasing trust. Confidence in the approach will reach a point where sharing can be extended to parties beyond the supply chain. These parties could include consumers, NGO’s, other interest groups/stakeholders etc. who have some vested interest in the “sustainability performance” of the supply chain and the parties it is comprised of. As with Step 3, the information sharing is always voluntary, and the farmer can control who is shared with and what information is shared. What will be shared is a detailed view of reality at farm-level that they otherwise would have great difficulty to collect. Armed with this “ground truth” they can then engage the supply-chain and its members to scrutinize the output. These external parties are not bound by the Letter of Commitment and may subject the supply chain to a harsher critique. But as external VEL’s are formed so new ideas and conversations develop that can add to the understanding of challenges faced and the development of more robust and effective responses. As the engagement between the farm, the retailer and the external parties develops so the strength and credibility of the sustainability program increases. The systematic building and nurturing of VEL’s can enable mature relationships based on trust and transparency to develop. The VEL approach proposed here protects the benefits of bottom-up processes of change while addressing the question of assurance: if you openly disclose information with me about your business and I am able to engage in a dialogue with you around that information, why do I need a third-party auditor to verify what you are telling me? And the more you share with other parties the more robust and credible the entire process becomes. The Steps in the development of VEL’s for supply chains is summarised in the diagram below. Putting all the technical language aside, VEL’s are simply about forging productive relationships between parties. This takes time and patience. Achieving true sustainability gains requires a move away from compliance-led approaches, and a step into the less structured world of relationship building. We can have the illusion of control and zero real change towards sustainability, or we can embrace a new approach that hold genuine potential for fundamental change. The choice is ours. If you are interested to share your thoughts regarding what is presented here about VEL’s and/or other approaches to supporting credible bottom-up programs in supply chains, please contact us, we would welcome your inputs. Transparency in Supply Chains: Is Trust a Limiting Factor? M Frentrup and L Theuvsen. Paper prepared for the 99th EAAE Seminar ”Trust and Risk in Business Networks”, Bonn, Germany, February 8-10, 2006.
https://bluenorth.co.za/wp-content/uploads/2018/09/team-hands.jpg 168 301 David Farrell https://bluenorth.co.za/wp-content/uploads/2015/12/Blue-North-Logo-Header-300x125.png David Farrell2018-09-27 09:27:502018-09-27 09:40:28Virtuous Engagement Loops - An approach to move beyond certification.